A company named Senseg has revealed a prototype of a "Feel Screen", a new touchscreen technology that utilizes electrostatic fields to induce a tactile response. Senseg claims the technology can be used to produce a range of effects such as rough textures, edges and vibrations. The first products with Senseg's technology may arrive in 2013 or later. 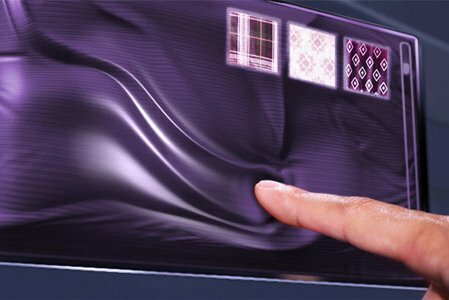 Dubbed the “Feel Screen”, it utilizes electrostatic fields which can be felt by our fingers to induce a tactile response. According to Senseg, this is done by creating and controlling a small attractive force between the screen and the finger generated from this field, thus producing a range of effects such as rough textures, edges and vibrations, just to name a few. We can expect to have this experience across devices of various screen sizes as the company states that the system is scalable. The technology has promising applications in enhancing user interfaces such as creating a touchscreen keyboard that has a perceptible separation between each key as depicted visually on-screen. It may also become an important piece in bridging tablet technologies to the blind.